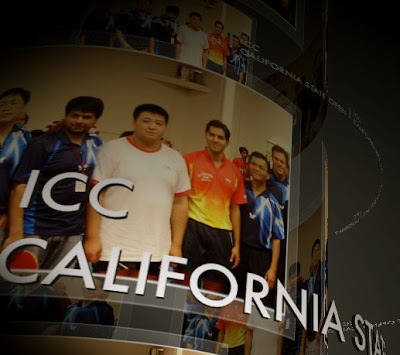 The India Community Center (ICC) Table Tennis Center in Milpitas hosted its second USATT* sanctioned tournament this past weekend – the first in its new full-time 10,000 square foot facility on North Milpitas Boulevard. Yes, you read that right. 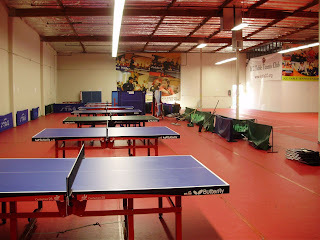 A full-time table tennis club of this size does indeed exist in these United States! What a treat – especially the food! ICC Table Tennis Center head coach and manager Rajul Sheth managed to serve EVERYONE free food and beverages throughout the 3-day tournament. 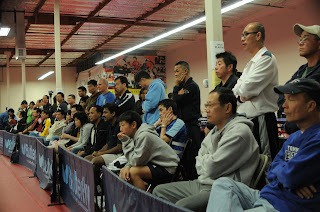 The number of entrants received for this tournament worried tournament director Bruce Liu. There were 172 – including former Controller and Chief Fiscal Officer for the state of California, Steve Westly, in his first tournament. He was California Campaign Co-chair of Obama for America and was a member of the campaign's finance committee. Bruce had run last year’s tournament but then there were only just over 100 entrants. This time four of the events were booked to their maximum capacity. But with the help of some passionate volunteers and a bit of luck, the tournament kept on schedule, and by all accounts a good time was had by all. Preparation of the venue for the tournament started at 7:30 AM on Friday under the direction of ICC Table Tennis Center manager Rajul Sheth. All tables were moved away. The professional grade floor mat was vacuumed. The tape on the floor mat was redone. Four brand new STAG tables were assembled. Rajul was obsessive in his desire to make the venue look perfect, and the results showed it. The tournament started with the youth events on Friday evening. It was so fun to see these young kids compete. Kunal Chodri – the Boys' Under 9 winner – had a USATT rating of 250 when he played in the tournament at ICC last year. This time he was the top seed with a rating of 1517! It was a similar story for runner-up Krishnateja Avvari. He had a rating of 284 last year, but his rating for this tournament was 1217. Apparently the junior program at ICC has been doing a great job. According to Rajul Sheth, ICC's week-long Thanksgiving training camp was so popular that they will do it again during the Christmas week. There were few upsets in the opening round of the Open Singles, with nine of the top seeds advancing from the eleven round-robin groups. However, the same could not be said for the playoffs. The top two seeds in the tournament were both eliminated in the quarter-finals. The top seed – JiaQi Zheng (2644) – is the second highest rated female player in the US behind only many-times US Women’s National Champion and 2008 US Olympian Gao Jun. Perhaps not yet recovered from the grueling Northern America Teams tournament in Baltimore a week prior, she was upset by a new kid on the block – 19-year-old Zhe Hao Wang (2407), who just arrived in the US two months ago. Zhe Hao's exuberant style and fighting spirit – and probably his underdog status – made him a crowd favorite. The second seed – Hailong Shen (2528) – had just returned to the US in November and is now a full-time coach at ICC. Trevor Runyan (2354) apparently was not intimidated by his opponent’s lofty seeding and rating. He quickly dispatched Hailong three straight. However, the third-seeded player, Chao Fan (2527) – a former top player in China – and the fourth seed, Jitendra Gidla (2516) – a former India National team member – got revenge for their colleagues in the semi-finals by stopping Zhe Hao and Trevor, respectively, to set the stage for the final. Chao had coached in Mexico before coming to the USA last year to coach full-time at Ping Pong Dojo, also located in Milpitas. Jitendra is currently a full-time graduate student pursuing his MBA degree and a part-time coach at ICC. So it would be an all-Milpitas final! Before the final started, the court was re-arranged to make sure there was sufficient room for the players, and enough chairs and sight lines for the spectators. By this time, only the U2150 and U2350 finals were still left to play. Hundreds of die-hard table tennis enthusiasts stayed late to watch the Open Singles final and they would not regret it. The two finalists were different in almost very aspect – nationality, club affiliation, playing style, size, etc. – but there was at least one thing in common. Both of them used their brain as their most powerful weapon. This match was like a chess match. You could almost see the strategy changing game by game. Chao won the first game relatively easily. Jitu – Jitendra's nickname – came back to win the next three. But the Open Singles final was best-of-seven (the only best-of-seven match in the entire tournament), so the job was not yet complete. Just when the crowd thought it was over, Chao refused to let go. He managed to win the next two games in spectacular fashion to even the match – three apiece! The seventh game was nerve-racking. The game was tied at 1:1, then 3:3, then 4:4, then 5:5, then 7:7, then 8:8, and finally 9:9! When Jitu took the last two points to claim the Open Singles championship, the crowd went absolutely crazy. What a match! Hundreds of spectators left happy at their decision that Sunday to drive to Milpitas and spend their afternoon at the ICC. On their way out, quite a few spectators congratulated Rajul and Bruce for a well-run tournament and suggested they turn it into a regular quarterly event. But Rajul and Bruce – what with their droopy eyes showing the tell-tale signs of sleep deprivation – were not too sure about that idea!